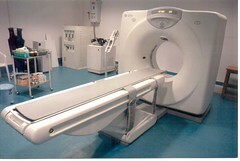 The CT scan went well this morning. I was really nervous about her not eating for an extended period of time, but her night nurse did a great job of helping me make sure Maddie ate at the last possible moments. It was a bit of fiasco getting her down to the CT area. They insisted on bringing her crib down, and tried to get me to lay her in the crib for transport. I knew if I laid her down she would get fussy and that wouldn’t be a good way for her to go into a procedure where she had to be sedated. So I just told the transport orderlies that I was carrying her, and that was that. She looked soooo tiny on the end of it! Do you see those straps hanging off the side? Well, they couldn’t be used because a strap would have covered her entire body. The anesthesiologists were great. There was a possibility that she might have needed to be put on a ventilator, but they made sure that didn’t have to happen. Maddie didn’t seem bothered by the experience, except for right when they put her under. The anesthesiologist said that one of the drugs would sting a bit as it went in her IV, and she definitely whimpered as it was pushed into her bloodstream. It was so sad. Luckily, she woke up about 10 minutes after the scan was over, smiling and looking for food. Dr. Lung was there for the scan, which was really surprising. She looked at the scans right away, and then told us that she needed to think about it. After some thought, she laid it out for us. 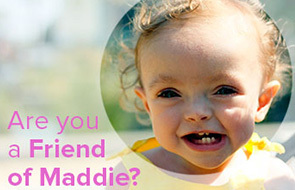 It looks like Maddie either has something called Bronchopulmonary Dysplasia (BPD) or Children’s Interstitial Lung Disease (chILD). I’m just going to nutshell these here. BPD involves abnormal development of lung tissue. It is characterized by inflammation and scarring in the lungs. It develops most often in premature babies, who are born with underdeveloped lungs. Most kids outgrow BPD. chILD (and seriously, isn’t that just the most darling acronym) is a group of rare lung diseases found in infants, children, and adolescents. There are different types of chILD that vary in their severity and in their long term outcomes. I don’t know if kids outgrow this or not. The only way it can officially be diagnosed is through a biopsy of the lung tissue. Anyone can get chILD, not just premature babies. I really haven’t done a lot of research on either of these. I knew that she was a candidate for BPD; in fact, it is listed on her discharge papers from the NICU as “suspected.” As far as the chILD goes, there are a lot of different kinds and severities, so I am not going to get too worked up about it yet. I’m mostly going to stay away from Google other than to familiarize myself with the terms Dr. Lung will use when she talks to us about it all tomorrow. Her Upper GI series is still on for tomorrow. Dr. Lung still wants to rule out reflux. After spending the last four days with our roommate and his terrible reflux, I am certain reflux isn’t an issue for Maddie. The Internets do tell me that ruling out reflux is important when trying to diagnose chILD, so I will go along with the test. It supposedly isn’t that bad as far as tests go, but I’ll believe it when I see it. A lung tissue biopsy, however, is surgery. If Dr. Lung decides to proceed with the chILD diagnosis, then we will schedule the biopsy. I don’t know if it would be ASAP or if we’d schedule it outpatient. If it can’t be done by Friday, I want Maddie out of there. She’s been off oxygen since noon, and that is always the biggest factor keeping her in the hospital. The longer she’s in there, the more likely she is to catch something new. I came pretty close to hitting my wall today. It’s that same trap I think everyone falls into when they have a lot of stuff going on. I am so consumed by everything that I’m not getting enough sleep, and all I can think about is Maddie and what is going on with her. I had a small breakdown when I spoke on the phone with Human Resources at work. Everyone there is so supportive but I feel like I’m being pulled in a lot of different directions. I’m hopeful that tomorrow we’ll have a course of action in place, and that will help me feel like things are more under control and I can relax. All this unknown stuff doesn’t sit well with a control freak like me!!! I really do have all this funny stuff to say. Maybe if I didn’t wait until 11:50 at night to write my blog I would have the energy! Here’s to tomorrow being a better, funnier day! Every time I mention cystic fibrosis, take a shot.Every time I mention cystic fibrosis, take a shot. I too hope for a better day for you. Let’s hope Dr. Lung makes some decisions so that you can get Maddie better and out of the hospital. Sending some sunshine your way. You are holding up wonderfully for all the stress and heartache you’re going through! Maddie seems to be one tough cookie, too! You are so strong heather! I am in awe of you. Work is not what you should be focusing your energy on right now… Maddie will be fine and healthy, Ijust know it. Dont stress until they tell you to stress. Hi Heather, I’ve been keeping up with your blog ever since you left a comment over on mine. I cannot imagine how hard this must be for you. I thought our one measly night in the hospital was miserable, but that’s nothing compared to what y’all are going through. Seriously, hang in there, you & your family are in my thoughts. Heath – I’m reading your Twitters…. as if being in the hospital with Maddie isn’t bad enough?! Hey – turn on your old seagull alarm clock….that’ll keep ’em away. Hang in there, Spohrs!! !